Disposable drink containers are among the most ubiquitous waste generated by first-world populations. Some parts of the world have opted to charge deposits for drink containers: a few pennies which are refunded when you recycle the containers. 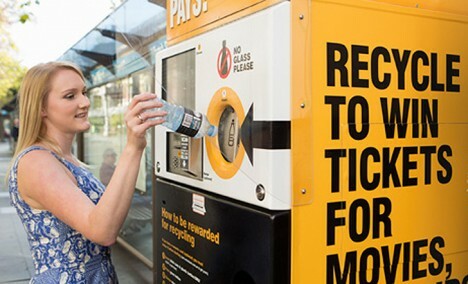 In Australia, the container deposit plan is just starting to take shape, and they’ve implemented a clever way to encourage recycling. “Cash for Containers” is a simple plan. You just take your empty cans and bottles to reverse vending machines. When you put a container in, you get vouchers, cash, or rewards. The machines let you choose your own reward – bus vouchers, movie tickets, chocolate bars, and various other choices. 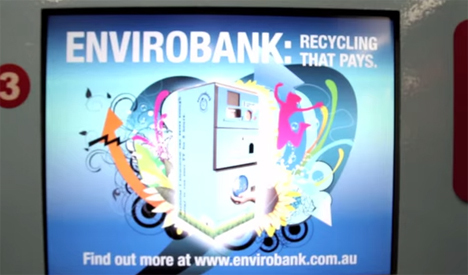 Envirobank, the company behind the machines, hopes that the initiative will help Australians recycle much more of their waste. Cans and plastic bottles take hundreds of years to break down, so paying that extra 10 cents per drink and then getting rewarded for recycling the containers seems like an effective plan to keep huge amounts of garbage out of the landfill.